Frank Wiafe Danquah was raised in Amsterdam and started his football career in the Ajax youth academy. At the age of 16 he went abroad to England, developing in the Newcastle United youth academy. He made his reserve team debut against Manchester United on 1 March 2007. Already a few months later he also made his first senior appearance (as a substitute) for United in the 0-1 away friendly defeat at Hull on 1 August 2007. In 2008 Frank signed a professional contract with the Magpies. Having minimal playing opportunities Danquah was released in summer 2010 from his contract. The forward continued his career abroad with signing a 2-year contract at Hungarian club Ferencvárosi TC. However after a few months his contract with the club was disbanded though due to financial problems in late 2010 and he was released. During the spring of 2011 he was on a short term contract at Belgian club Waasland Beveren. After playing on trial at a Turkish club, he returned to England to get a chance for a contract. 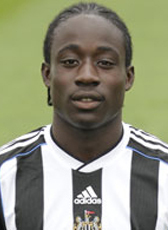 Danquah was in October 2011 a trialist at Conference club Gateshead FC. Finding no professional club, he finally retired from professional football and tried his luck at the amateurs of Newcastle Benfield and SS Ladzio in England. In the 2013-14 season, Danquah was under contract at Romanian first liga club FC Brasov. He returned home in summer 2014 to join second tier club Achilles 29 for the 2014-15 season. In the 2015-16 season Danquah went on to play for FC Lienden, the Amateur champion of 2015.